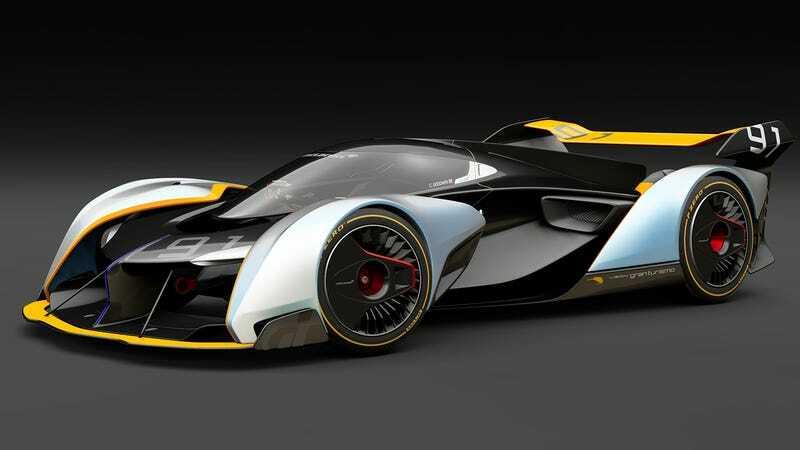 Last year, McLaren made the Ultimate Vision Gran Turismo concept, a car that you lie prone in to drive and also one that only existed inside the video game Gran Turismo Sport. Now, McLaren has confirmed it’s building a real car likely inspired by that concept. The car is called the BC-03, short for Bespoke Commission 03, according to PistonHeads. The website also got a statement from McLaren confirming the car’s development. McLaren confirmed the existence of the project, codenamed BC-03, to PistonHeads, stating: “BC-03 is a bespoke customer commission being created by McLaren Special Operations,” but it withheld any details “because the specifics of the project are confidential between MSO and its client”. McLaren also has the three-seat, 1,000-horsepower Speedtail in development, a $2.3 million car which has already sold out and which has gold badges if you want, though the BC-03 is expected to be even more focused on track performance. That will likely include a lot of carbon fiber, and a hybrid powertrain not dissimilar from the one that appeared in the video game, or an electric motor for each front wheel in addition to a twin-turbo V8. And, as PistonHeads notes, if it turns out to be hybrid, the BC-03 would be the continuation of a new-look McLaren that has said that by 2025 every one of its cars will be hybrid in some fashion, with some capable of running full electric. Right now the P1 is the only hybrid, though that was just the beginning of McLaren’s ambition.